White in the Water Garden - Aquascape, Inc.
Everyone loves the pop of a pink lotus or bright yellow waterlily, but have you ever considered adding whimsical white to your water garden? White is the magical reflection of all colors and all wavelengths. If one of the colors is subtracted from white light, you see the complementary color. For example, if yellow is subtracted from white light, you see blue. 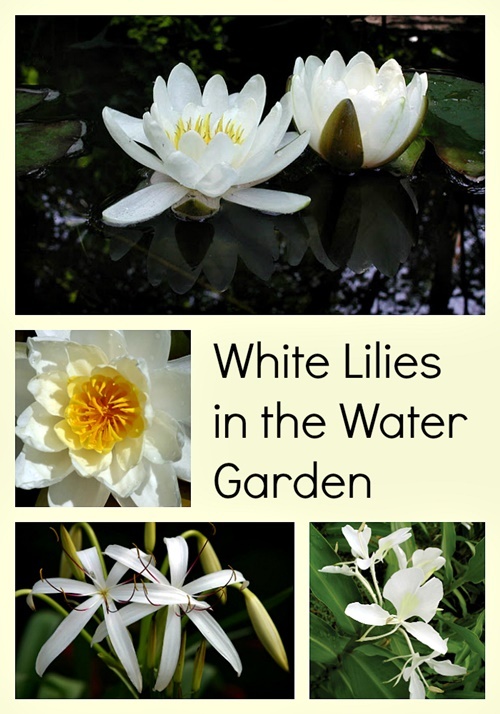 Nature is so amazing … and the following white aquatic plants certainly prove that point! 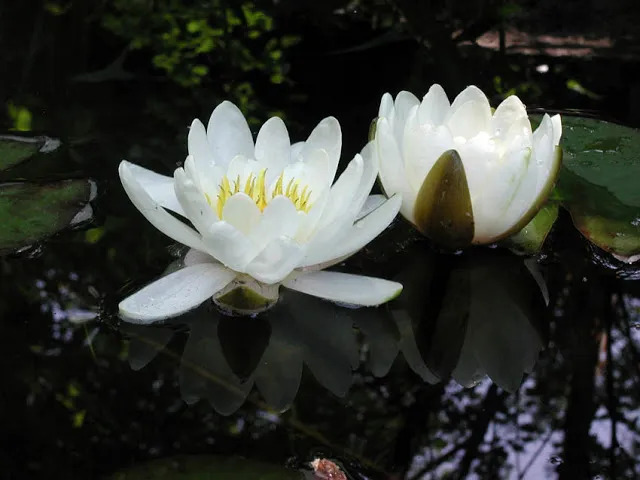 Some of our favorite white aquatic plants include a range of waterlilies, like this pair of flower resting atop a cool pond, one fully open and the other just awakening. Nymphaea odorata – or American White waterlily – is a popular choice for its sweet fragrance. Other favored white waterlilies include Hermine and Virginalis. This breathtaking, night-blooming tropical Trudy Slocum waterlily will delight you as the sun sets on the horizon. Its crisp white petals play off the cool blue of the pond and deep green of the lily pads. The aquatic crinum lily is dainty and elegant all at once. Add these to your water garden or a boggy area for an architectural statement. And be sure to enjoy their gentle beauty up close. Hymenocallis, or Spider Lily, is an easy-to-grow, reliable moisture-lover. If you love green and white combinations, you’ll love this compelling flower. Although it grows primarily along the edges of a pond, you can plant it in soil, too (just remember to keep its feet wet). Refresh yourself on hot summer days with this cute little Water Snowflake. Although tiny, this bloom is loaded with intricate detail. Got shade? Then you’ll want to add White Butterfly Ginger to your water garden. Its intoxicating scent is as fragrant as a Gardenia. It’s considered invasive in some areas like Hawaii, so keep your eye on it and divide it, if needed. You can always share it with a friend! Do you have any of these pale beauties in and around your pond? They’d make a great addition to any water garden!